Just after I (read that as my husband) told my parents that we we’re expecting Flump, a couple of the ladies on my Pregnancy Support Group were talking about hand held dopplers. I immediately thought “there’s no way I’m going to get one, they must cost an absolute fortune!”. To my surprise, they weren’t. £19.99 on Amazon. So I told my mother that I really wanted one. I wasted no time in trying to listen to Flump. It wasn’t perfect, and more often than not, I didn’t hear anything. In fact I think in between week 10 and week 15, I’d heard Flumps flutter about 4 times. All of a sudden at 15 weeks, there it was. “Oomph! Oomph! Oomph!” But about 50 times faster. It was quite literally amazing. After our first ultrasound scan, I realised that I could press down and wiggle my tummy to get Flump to move. So I started doing this whenever I listened on the Doppler. One minute I could hear and the next minute it faded and disappeared, small wiggle and Flump was back. It really is the most amazing sound. I’m counting down the days until I finally get to meet you Flump and I cannot wait. I’m so excited to see you (even though you will very likely be covered in goo and blood and maybe your own poop) and I can’t wait to hold you against my chest so I can feel your heart next to mine, rather than just hearing it. I still can’t quite get over the fact that in 23 weeks (give or take) we will have a tiny baby that depends on us. Yesterday we went baby shopping for the first time. My parents (who are moving abroad for 6 months) took us shopping so they could get the baby some stuff. 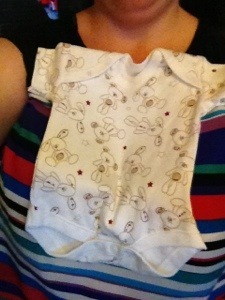 Baby clothing is so incredibly small, and gets even smaller! We mainly got stuff in a 0-3 months size, however there is a tiny baby size (up to 8lbs) and also preemie baby sized (up to 4lbs). Baby clothes are freaking adorable! But I noticed that not many shops do outfits that are suitable for both sexes. Everything is either girlie colours of pink/purple or boyish colours of blue and dark green. Even some of the supposedly “unisex” clothing didn’t look as though it’d be suitable for both boys and girls. This is incredibly hard for us, considering that we aren’t going to find out if Flump is a boy or girl, until the midwife declares it. It is also amazing how many clothes small people need. For example, once bathed, powdered and diapered, they need a vest, and socks, then a baby grow (onesie) as well as a cardigan, scratch mittens and booties plus a hat. Then you have to wrap them in a blanket. You’ll probably have to change them about 4 or 10 times a day (depending on the sick quota or whether or not they’ve done a spectacularly leaky poo). So despite the fact that we have a huge amount of miniature clothes, we need more. More baby grows, bibs, socks, little hats, blankets. Not to mention the mama stuff for Breastfeeding and expressing. As well as towels and sheets and baby baths and cots and, well, there’s a LOT of stuff. I’ve no idea where it’s all going to go. I’m sure we’ll find room. 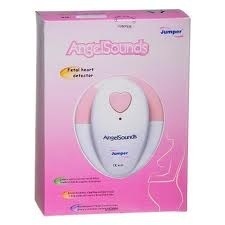 In the meantime, I suppose ill just set up a gift list for my baby shower.